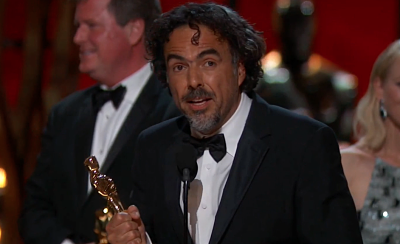 Alejandro Iñárritu swept the Oscars with his film Birdman. Alejandro Iñárritu won the Oscar for writing, directing and producing the film Birdman. Let's remember him as the director who made the film Amores Perros in Mexico and then came to the US where he made movies like Babel and 21 Grams, that always included Latino story lines. This win makes it the second Best Director in a row that is Latino, following last year's win from Alfonso Cuaron for Gravity. These two men along with their friend Guillermo Del Toro (another extraordinary film maker), are immigrants, fully Latino, fully Mexican and fully mainstream. We have to be proud and know that we are all on the same road, every day doing our work in a grounded way, to live a life that is the best of both worlds. This weekend, I saw another film McFarland USA, that I know will inspire you and make you cry. I cried through the whole film with joy. It is about a team of Latino cross country runners from McFarland, California. It reminded me of how difficult our climb is, how often we want to give up, and how easy it is to quit. But, if we put a big dream in front of us that is present every day, if we really want it and then do the steps every day, we can accomplish it. The greatest joy is the feeling of authentic personal accomplishment.